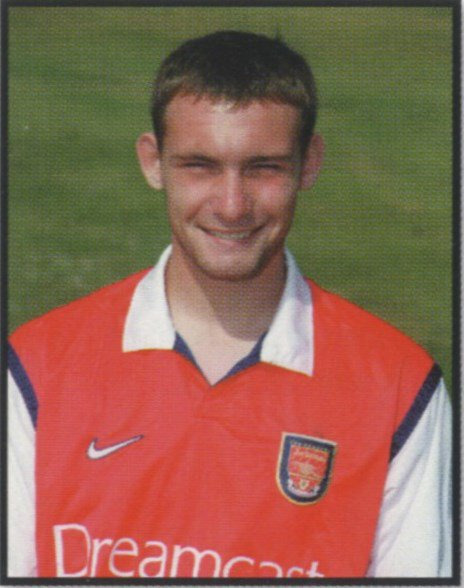 James MacDonald was a Scottish schoolboy international defender whose promising Arsenal career was ended while still very young by cruciate ligament injuries. Born on 22 February 1979 in Inverness he was identified very early as a promising footballer. A schoolboy international for Scotland Under-15 at the age of 13, this midfielder caught the attentions of Crystal Palace, Glasgow Rangers and Arsenal. 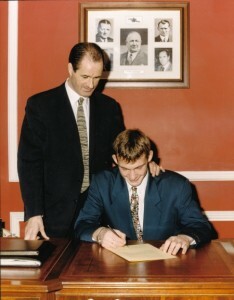 MacDonald played youth football for both Palace and Rangers, but when Arsenal showed an interest at the age of 15, he decided to move down to London. He joined as a trainee in Christmas 1994 and was moved from midfield to centre back. MacDonald spent three seasons in the youth team with later first teamers such as Ashley Cole and Stuart Taylor. He broke into the reserves and signed professionally in 1996. James’ first cruciate ligament injury occurred at 18. After fighting back and re-appearing for the Gunners it happened again, and a doctor’s recommendation spelt the end of his playing career. He was released in the summer of 2000, and moved back to Inverness with his family. He made 90 youth team appearances scoring four times, and appeared in the 1994-5 Southern Junior Floodlit League final which was lost to Wimbledon. He only made 2 Football Combination appearances as the cruciate ligament issues that were responsible for ending his football career almost totally eroded his time as a reserve. He took up bricklaying and later worked in the power industry but last year was diagnosed with Pericardial Mesothelioma, a rare form of heart cancer. James MacDonald passed away at the tragically young age of 36, on 20 January 2016.